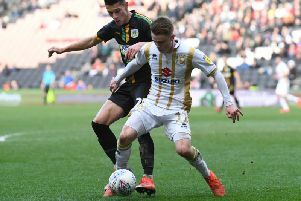 From impressive debuts and injury returns, there were plenty of positives to take from MK Dons' 5-1 friendly win over St Neots on Monday night. Paul Tisdale's first team squad took to the pitch for the first time at the Premier Plus Stadium, with 24 players getting game time in the comfortable victory. While the difference in quality was plain to see - St Neots ply their trade in the Southern League Premier - it was a consummate performance from the new-look Dons, even if the new white and gold shirts continue to split opinion. Welsh international Joe Walsh, not seen in a Dons shirt since January, looked comfortable after returning from a knee injury, playing 45 minutes and keeping the Saints quiet, by and large, throughout. Equally impressive were second half central defensive pairing Jordan Moore-Taylor and Finn Tapp. While Moore-Taylor brings with him League 2 experience under Tisdale, Tapp will be looking for a breakout season and already looks built for the job beyond his 18 years. Mitch Hancox saw fairly little of the ball in the second half as Dons, but looked lively and keen to overlap; Lawson D'Ath provided a strong link between the midfield and front line, while Robbie Simpson brought something different to the table when he came on for the final 15 minutes. After being linked to several top-flight clubs last season before a knee injury sidelined him for most of 2018, Dylan Asonganyi returned against Newport Pagnell Town on Saturday before a stand-out showing against St Neots, culminating in a stunning goal from 30-yards. The one blot on the copybook though was the injury suffered by Brandon Thomas-Asante. Like Asongyani, Pawlett and Walsh, the youngster missed the end of the campaign through injury, but hobbled off after just 17 minutes when one of the St Neots players landed on his recently healed ankle. There was no game time for Alex Gilbey, who watched on from the stands along with another of Monday's signings Ryan Harley, while Chuks Aneke and Osman Sow also missed out on the action as they continue to rehab ahead of the new campaign. Brandon Thomas-Asante worryingly hobbled off after 17 minutes. With plenty of training, conditioning and football to be played between now and the first day of the season, it is still too early to form any real judgements on Tisdale's new squad. But based on Monday night's showing, it already shows more signs of life than the one which signed off in May.